Back in June, BCBS of Minnesota announced that they were pulling all of their PPO plans out of the state. Aside from that, and some hefty proposed rate hikes for everyone else, there hasn't been a whole lot of news out of the Land of 10K Lakes. Health insurers are boosting individual market premiums by an average of 50 percent or more next year, increases that regulators say are necessary to save a market that otherwise was on the verge of collapse. The increases were announced Friday by the state Commerce Department, and show premiums will jump even higher than proposed rates that were made public on Sept. 1. At that point, carriers sought increases ranging from 36 percent to 67 percent. But the final average increases will range form 50 percent to 67 percent, depending on the insurer. PRO TIP: Cite Your Sources. As the dust settles on the Affordable Care Act, New Hampshire is feeling tremors from shifts occurring nationally, although the state’s health care landscape is more stable than the rest of the country. About a quarter of the nation, geographically, and around 17 percent, demographically, only have one insurer on the exchange, meaning less competition on rates, and therefore higher costs. Over the past year, UnitedHealthcare, Aetna and Humana have pulled out of the markets in most states, not getting the healthy populations they expected. It's a good article, full of stats, figures, context and quotes. THere's even a nifty pie chart showing the relative market share of the carriers and so on. Only one problem; can you spot it? Read more about PRO TIP: Cite Your Sources. "68% think we give too much in aid, and 59% think it should be cut." Read more about "68% think we give too much in aid, and 59% think it should be cut." A few weeks back, the CDC released the results of the latest National Health Interview Survey, considered the gold standard for measuring U.S. insured/uninsured rates; it concluded, unsurprisingly, that thanks to the ACA, the uninsured rate in the United States has plummeted from 16% in 2010 to it's lowest level in pretty much forever, just 8.6%. NHIS's methodology is more comprehensive than that of, say, the Gallup-Healthways quarterly surveys, which doesn't include children, so the numbers are understandably a bit different, but the results are unquestionable: For whatever other flaws it may have, the Affordable Care Act has dramatically lowered the uninsured rate in the United States. I've written a lot in the past about off-season exchange enrollments, otherwise known as SEPs (Special Enrollment Periods). For the most part, SEPs refer to people who enroll in individual policies after the official Open Enrollment period. They're allowed to do so for a variety of reasons: If they move outside of their rating area; if they get married or divorced; if they give birth or adopt a child; if they get out of prison; if they're discharged from the military; or, in most cases, if they lose whatever current healthcare coverage they have due to losing a job, etc. Over the past 3 years I've estimated that somewhere between 7,000 - 9,000 people sign up for ACA exchange coverage via SEPs every day during the off season, and I've been proven pretty much dead on target on the rare occasions that hard data has been released. Now, that may have dropped somewhat this year since CMS has cracked down on verifying SEP eligibility, but that's still an uknown. 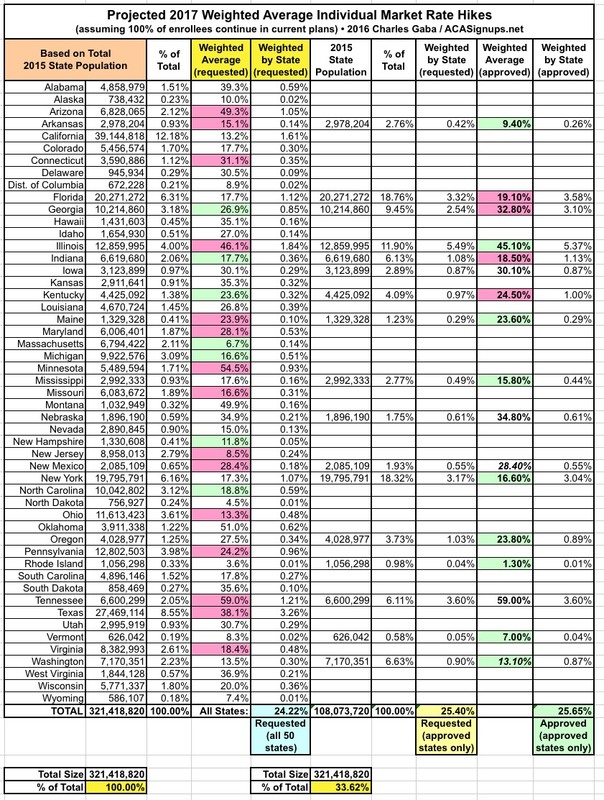 Every time someone selects a QHP via one of the ACA exchanges, the official 12.7 million tally for 2016 continues to go up. At the same time, there has obviously been a lot of of attrition as people drop their policies throughout the year. The official effectuated enrollee number as of March 31st was down to 11.1 million people...a 13% drop from the 12.7 million who had selected QHPs as of the end of January. UPDATE: As usual, the truth wasn't enough for Trump, so he doubled it & then lied on top of that. When I decided to once again launch my Annual Rate Hike Estimate project this summer, I knew that this year, the rate increases for the individual market were likely to be significantly higher than in years past. Coming as they are in an election year, as a Democrat and ACA supporter, I obviously took no joy in reporting this truth. However, a) The data is the data; it would be dishonest of me to try and ignore reality; and b) I knew that if I didn't report the rate increases as accurately as possible, Donald Trump and his Republican Party would flat-out lie about them. Read more about UPDATE: As usual, the truth wasn't enough for Trump, so he doubled it & then lied on top of that. Trump on his ACA replacement plan: "You will be making your own deals and they will be greater than you ever thought possible"
Pretty incredible in new WaPo/ABC poll: On health care, voters favor candidate who can't even describe his plan. Good news (? ): The Post published wrong poll results + fixed 20 minutes ago. Here's corrected data on health care. Read more about I give up. Lots of healthcare reporters, pundits, executives, providers and politicians are likely issuing a huge sigh of relief at this moment, because after month after month of various insurance carriers announcing that they're dropping off the ACA exchange in certain counties only, state-wide or even dropping out of the individual market entirely (or that they're going out of business altogether, as in the case of four more co-ops), today was the deadline for carriers to officially commit to participating in the 2017 Open Enrollment Period starting on November 1st. A couple of days ago, I noted that the latest development in House v. Burwell (the lawsuit brought by former Republican House Speaker John Boehner on behalf of the GOP caucus in the House of Representatives) could, in a worst-case scenario, end up resulting in millions of exchange-based policies being terminated with little notice. Basically, the HHS Dept. has included an "escape hatch" for exchange carriers in the event that the Supreme Court eventually rules in favor of the GOP House when it comes to Cost Sharing Reduction (CSR) financial assistance, although a final ruling wouldn't be likely to happen for at least another year or so. Today, Michael Cannon of the Cato Institute has posted his own entry about the HvB "escape hatch" development, and while it obviously has an extremely anti-ACA spin, his conclusion is pretty much the same as mine (he assumes all 11 million enrollees would be kicked off their plans, while various state/federal laws could mean a much smaller percentage...but it would be pretty devastating no matter what). Estimate: 16% fewer people had to pay Individual Mandate this year! Yet the IRS Taxpayer Advocate Service included some preliminary statistics on 2016 ObamaCare mandate payments, officially called the Individual Shared Responsibility Payment, when it issued its below-the-radar annual tax season review on July 7. As of April 30, 5.6 million tax returns included mandate payments averaging $442 per return, compared with 6.6 million tax forms including average payments of $190 at the same point in 2015. More recent data from the IRS wrapping the past tax year show that the final tally for 2015 ObamaCare Mandate fines included payments on 8.1 million tax returns averaging $210 for a total of $1.7 billion. Read more about Estimate: 16% fewer people had to pay Individual Mandate this year! Hoo, boy...Could a GOP win in House v. Burwell result in 6 million people losing their coverage altogether?? Hey, remember back in May, when I noted that the House v. Burwell court case could, if ultimately won by Congressional Republicans, end up with several million people getting stuck with an extra $1,000/year in premium costs? In addition to the ACA providing "APTC" tax credits to those who qualify, the ACA also provides "CSR" (Cost Sharing Reduction) assistance to those who a) are under 250% FPL and b) enroll in Silver exchange plans. The CSR payments don't actually go directly to the enrollee; instead the insurance carriers cover the appropriate chunk of deductibles/co-pays, with the CSR funds going to reimburse the carriers. Former House Speaker, Republican John Boehner, sued the HHS Dept. and the Obama administration over CSR appropriations, claiming that since Congress never specifically appropriated funding for CSR payments, it's illegal for the HHS Dept. to reimburse the carriers. For the moment, the CSR assistance/reimbursements continue to flow...but if they were to be cut off, the insurance carriers would still be legally required to keep paying out CSR assistance, even though they wouldn't be reimbursed by the HHS Dept. This would result in the carriers either a) filing potentially millions of lawsuits to get legally-mandated reimbursements for each individual CSR claim, which would clog up the courts, or, more likely, b) it would result in the carriers basically saying "screw this, I'm just gonna jack up rates by $1,000 a pop to cover my CSR losses". However, due to a quirk in how the metal levels and CSR rules work, only Silver plans (the ones with CSR) would have their rates increase...meaning that Gold plans could end up costing less than Silver, which would just confuse the hell out of everyone. Read more about Hoo, boy...Could a GOP win in House v. Burwell result in 6 million people losing their coverage altogether?? Urban Institute: At least half* of ACA plans cost LESS than employer-sponsored insurance? There's obviously a lot of people getting upset and concerned about ACA-compliant individual market policy rate hikes shooting up significantly next year. Heck, I'm probably responsible for some of this concern due to my 24-26% national weighted average estimate being referenced in every healthcare story from Forbes to the New York Times and even The Economist (my estimate has been pretty much confirmed by Barclays, FWIW, although for all I know, they might've even cribbed their data from me as well). Insuring people through Obamacare — which was crafted in part to cover people who can't get health insurance through their jobs — may be costing less money than if they had employer-based coverage, a new study suggests. The study, by the Urban Institute, comes as premium rates for 2017 Obamacare plans are being finalized. Those premiums are expected to rise more sharply, on average, than in recent years. But the report found that certain key Obamacare plans, on average, cost 10 percent less in premiums than average employer-based coverage, when adjusting for how much the plans cover for medical services, as well as for adjustments for health-care usage and age distribution. Read more about Urban Institute: At least half* of ACA plans cost LESS than employer-sponsored insurance? Arizona: Never Mind... Turns out AZ is just swapping out Cigna for Centene. Yesterday I reported that after the big scare about Pinal County, Arizona possibly having no carriers on the exchange, and the rest of the state only having one available, things were looking up as 1) Blue Cross Blue Shield agreed to jump back into Pinal after all, followed by 2) Centene also expanding coverage into a couple of counties, meaning 2 carriers for most of the population. This isn't really the good news you were hoping for. With Centene in, Cigna is out. Maricopa County residents could have a new health insurer on the Affordable Care Act exchange next year, but it might not be the insurer that many local observers thought it would be. Read more about Arizona: Never Mind... Turns out AZ is just swapping out Cigna for Centene. Last month I noted (well, after Louise Norris called my attention to it) that after 2 years of restricting all individual market enrollments to their still-buggy ACA exchange, the state of Vermont actually reversed this policy for 2016 by allowing individuals to enroll in ACA-compliant policies directly through the carriers after all. This actually goes against the recommendations I just wrote about yesterday, leaving the District of Columbia as the only other exchange to require all indy plans to run through it), but given how many technical problems Vermont seems to still be having with their platform, I can understand them allowing direct enrollment for the time being. I stand by my recommendation that every state should eventually move everything onto the exchange in the future, however. Earlier today, the U.S. Senate Committee on Homeland Security and Governmental Affairs (not sure why those two are lumped into a single committee, but whatever) held hearings on The State of Health Insurance Marketplaces. Towards the end of the hearing (they were grilling several state insurance commissioners), Republican Senator Ron Johnson ended up quoting my "25-26% average rate hike" estimate for 2017, noting that this is significantly higher than the 12-13% average I (accurately) projected last year. Sen. Alexander comes up with the wrong solution to the right problem. In my latest piece for healthinsurance.org, I list seven reasons why other states should follow the District of Columbia's lead by requiring that all individual market healthcare policies be sold on the ACA exchange exclusively...along with, I also admit, three issues which would have to be dealt with in doing so. Read more about Sen. Alexander comes up with the wrong solution to the right problem. Read more about BREAKING: Government Agrees It Should Pay Money It Legally Owes! BLASPHEMY: Could FEWER carriers in the market actually be a positive thing?? I know, the headline is clickbait, but hear me out; lemme play Devil's Advocate for a moment here. If Cigna decides to stick with the exchange marketplace, it will have access to a solid mix of healthy and unhealthy patients, said Jim Hammond, publisher of the Hertel Report. "The first question is, will Cigna stay in," Hammond said. "If Cigna bails, then we have a real problem and the state and federal officials are going to have to figure out what to do about it. They've made this mandate and there's no way for people to actually meet the mandate." Once an insurance carrier gets a decent mix of healthy and unhealthy patients, and targets the unhealthy patients with special programs, then it should be fine, he said. I didn't really make a big thing out of it, but thought it was an interesting perspective. Read more about BLASPHEMY: Could FEWER carriers in the market actually be a positive thing?? According to the U.S. Census Bureau, the current total U.S. population is around 324 million people. Also according to the U.S. Census Bureau, during the 2014 election, there were appx. 142 million registered voters. Let's assume that the total number of registered voters is up to around 150 million even today. According to RealClearPolitics, at the moment, Donald Trump is supported by around 43% of registered voters. 43% of 150 million = 64.5 million people. Taking Clinton's "half" literally (which is of course unbelieveably silly), that's 50% of his supporters, or around 32.2 million registered voters. 32.2 million / 324 million = appx. 10% of the total U.S. population. In other words, if you take Hillary Clinton's statement literally, she's effectively saying that 10% of the U.S. population is racist. This is hardly a controversial statement. If you turn that around, the real reason Trump supporters are getting all bent out of shape this morning (hey, I thought they hated it when people are too "PC"!) isn't so much that Hillary said that a lot of Trump supporters are racist...it's because she (effectively) said that pretty much all racists are Trump supporters. This is also hardly a controversial statement. Over the past few days I've been doing some serious number-crunching in an attempt to break out the entire individual market between exchange-based, ACA-compliant off-exchange, grandfathered and transitional plans. For the most part, I believe most of my data is pretty close...but there's still some pieces of the puzzle missing here and there. Guess what? Several million OFF-exchange enrollees appear to qualify for exchange subsidies!! WARNING: This is a pretty long, wonky, number-crunchy post...if you want to skip to the point of it about 2/3 down, click here. Yesterday I posted an extensive entry in which I reiterated, with a substantial amount of hard data (h/t to Bob Laszewski & Steve Davis) to back me up, that the off exchange individual health insurance market is consdierably larger than many pundits, reporters, politicians and policy wonks seem willing to admit; in fact, it appears to make up around 36% of the ACA-compliant indy market if you include grandfathered/transitional plans, or around 40% if you don't include them. Read more about Guess what? Several million OFF-exchange enrollees appear to qualify for exchange subsidies!! Read more about Oh, yeah...meanwhile, the uninsured rate has dropped to a historically-low 8.6%. Steve Davis & Robert Laszewski confirm what I've been saying all along: Appx. 40% of ACA indy market is OFF EXCHANGE. For 2 1/2 years, dating back to around February 2014, I've been trying to hammer home the importance of the OFF-exchange individual market. Time and time again I've been stunned at the seeming blind spot that people who should know better (such as Avik Roy) have regarding the millions of people who are enrolled in fully ACA-compliant policies, but are doing so directly through the carriers themselves. There are a few reasons why people buying individual/family policies would do this, but the most obvious one is simple: If you earn more than 400% of the Federal Poverty Level (around 97,000/year for a family of 4), there's no reason to jump through the extra hoops of enrolling through HealthCare.Gov or the other various ACA exchanges...because you don't qualify for federal financial assistance anyway. For whatever reason, however, numerous reporters, pundits and even the HHS Dept. itself keep acting as though this market doesn't exist. Read more about Steve Davis & Robert Laszewski confirm what I've been saying all along: Appx. 40% of ACA indy market is OFF EXCHANGE. Since then there have been two major changes: First, Aetna, which had been planning on entering the Maine ACA exchange, infamously pulled a complete 180 and not only decided not to expand, but actually pulled out of the exchange in most of the states they're already in. This doesn't really impact Maine since they were only available off-exchange anyway. The second change does, however: Several of the carriers submitted revised requests, pushing the average up higher, to 23.9%. TALLAHASSEE, Fla. – The Florida Office of Insurance Regulation announced today that premiums for Florida individual major medical plans in compliance with the federal Patient Protection & Affordable Care Act (PPACA) will increase an average of 19% beginning January 1, 2017. Per federal guidelines, a total of 15 health insurance companies submitted rate filings for the Office’s review in May. These rate filings consisted of individual major medical plans to be sold both on and off the Exchange. Following the Office’s rate filing review, the average approved rate changes on the Exchange range from a low of -6% to a high of 65%. This information can be located in the attached “Individual PPACA Market Monthly Premiums for Plan Year 2017*” document.